An often repeated promise of the digital humanities, in the wake of the “computational turn”, is that the wide availability and accessibility of historical texts enables scholars to breach the restrictions of a literary canon. Such a potential for literary computing prominently returns in the works of computing literary theorists. The assertions that quantification entails a “widening of the canon” and eventually the advance of a “new philology”, easily invoke medievalists’ inquisitiveness. How, exactly, can the digital humanities provide such insights for the Middle Ages? As voices increasingly proclaim the emancipation of the digital humanities from their merely supportive role, and as the tools for digital medieval studies proliferate (e.g. 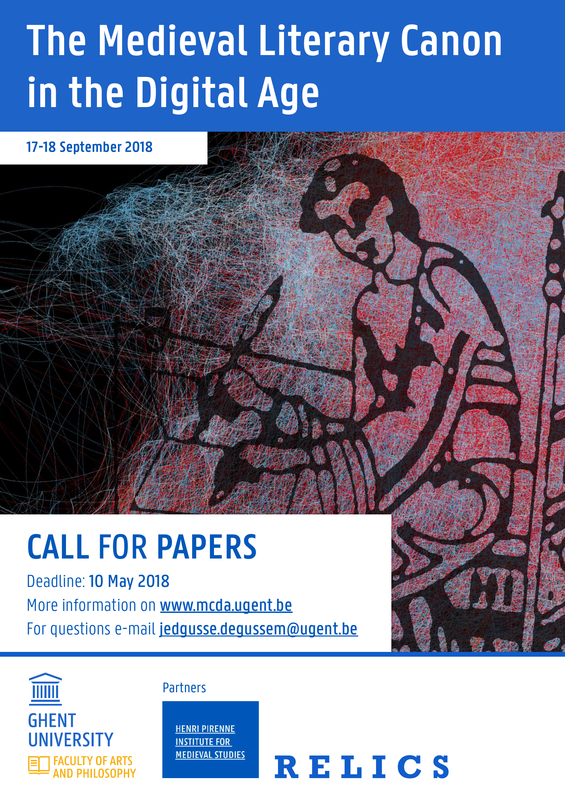 digital scholarly editing, computational stylistics, digital palaeography, digital stemmatology, …), this conference seeks out a confrontation between the two “new” philologies and their respective approaches towards a canon that has been formed under an “old” philology. It welcomes research that both problematizes the specialized character of medieval literary production, and yet demonstrates the potential for computational criticism to “breach” or “widen” the medieval canon through digital tools. The following invited speakers have confirmed their participation: Godfried Croenen (University of Liverpool) / Maciej Eder (Pedagogical University of Kraków) / Julie Orlemanski (University of Chicago) / Peter Robinson (University of Saskatchewan) / Karina van Dalen-Oskam (University of Amsterdam) / David J. Wrisley (New York University Abu Dhabi). The full programme is online!. You can register as a participant by sending an email to drs. Jeroen De Gussem. Registration closes on Monday, September 10th. There is a € 40,00 registration fee for both days, including coffee breaks and lunches. Conference speakers and members of the Henri Pirenne Institute for Medieval Studies are exempt from this fee.